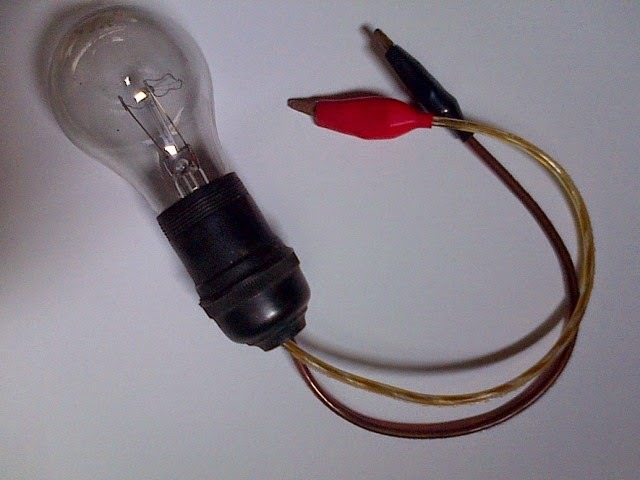 Many people may already know what is light bulb trick, if you haven't; please read and apply this on your repair bench to overcome headaches during repair the electronic equipment. Fixing electronic equipment was very fun and rewarding, especially if we are hobby in the field of electronics. Do not be surprised if there are people who become successful in repair work. As a repairer, we must always read and read. Why do I say it twice? Because from reading our knowledge of the field that had sharpened and professionally. From a few references and a friend, I think the safest thing and good for preventing our mistakes in the repair is to use light bulb trick, imagine if you forget to check one of the damaged components that shorted. Scary thing that may happen to the electronic equipment is going to explode or catch fire, and of course it is so insidious, so from now on making it a habit to always use a light bulb trick when repair power supply that has a short circuit. This trick actually has long been practiced by a professional repairer in times past. This continues because of the undeniable existence of this tool is very useful. The bulb is used incandescent bulb, do not use a fluorescent bulb because that is not appropriate. These tricks work because the light bulb is a nonlinear components. What it means is not linear? The resistance of the bulb will change according to the temperature at the bulb. If the temperature at the bulb rises, the resistance of the bulb will progressively increase and vice versa. broken back if there are still missing by us. How to set it up? It is not difficult. I am going to draw its schema for your better understand. We can see that the mains AC supply voltage line that has two lines Live and Neutral. 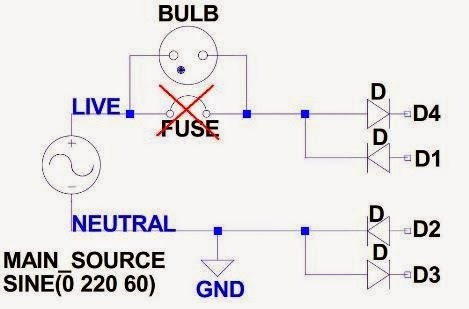 Fuse is usually mounted on the Live line to prevent fires in the event of a short circuit on the electronic device because its function is to disconnect the device automatically when the current that flows is too large. It can be seen that the diode 4 serves as a diode rectifier. You can see mine below. How to setup is fairly easy where we simply plug bulb into the feet of fuse, while the fuse is detachable. When a component in a device damaged shorted, then the bulb will light up brightly. In other words, if the light bulb does not light up when connected to the mains supply means a short circuit does not occur again. In fact, it is more practical if we directly use a lamp connected to socket and we connect devices that are ready to be fixed into the socket and the socket of the lamp is connected to the mains supply. That is up to you and have a fun ! Thanks for coming here.